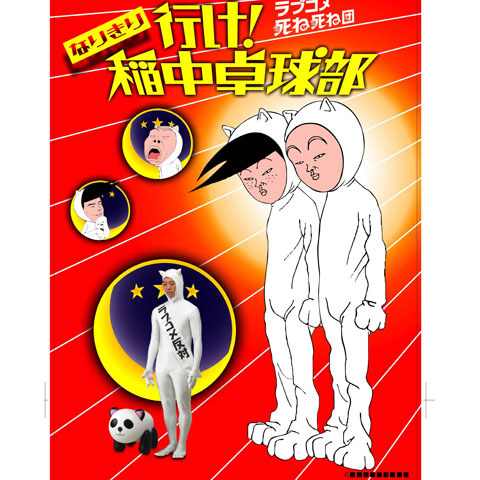 Our friends at Village Vanguard, Japan's "Exciting Book Store", are offering several bodysuit style Halloween costumes this year so sit down and prepare to be weirded out. Like many such get-ups, today's featured costume allows the wearer to emulate or imitate his or her favorite anime or manga character. It's cosplay (costume play) and for the most part it's harmless good fun... though I worry about the inflatable PVC panda bear that comes with this particular costume. Village Vanguard offers little info on why anybody would want to wear this polyester & cotton bodysuit, other than suggesting (via Google's wonky Japanese-to-English translating software) that one should "wear it to interfere with couples right now!" All-righty then! The suit is recommended for those under 170cm (68 inches or 5'8") in height and weighing below 70kg (154.5 lbs), which pretty much disqualifies the vast majority of non-Japanese adult men and women. Pity. This suit covers one's entire body from head to toe, leaving only the face exposed... if I was wearing this thing, my face would be the FIRST thing I'd want to cover. Ears and a black-lettered sash explaining the origin of the character are also included, all for the tax-included price of 7,329 yen (around $90). Perhaps most surprisingly of all, a notice at the Village Vanguard website states that the suit is SOLD OUT.